More chassis work done. 1/4 elliptic rear springs and coil-overs for the front. I found a bag of MPC or Monogram funny car chassis parts which have proved usefull. No pics as it doesn't look to different to the last one. Scratchbuilding a straight tube front axle. A mock up. Body propped on chassis. 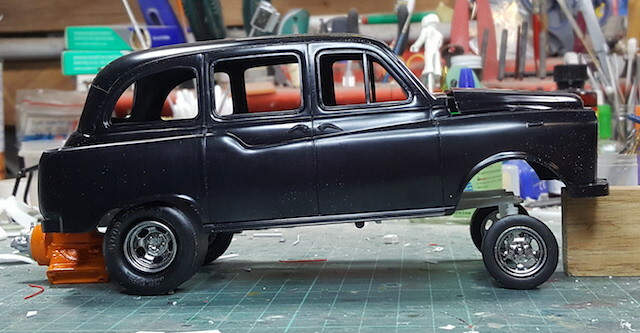 Hehehe, a London Cab as driven by George Montgomery! 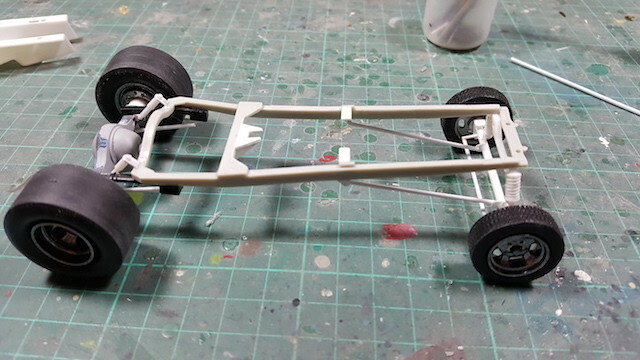 I have started work preparing the body shell and more small pieces of plastic have been attached to the chassis. And I have found a Funny Car seat/safety capsule thingo to use. Next up - scratchbuild some wheelie bars. 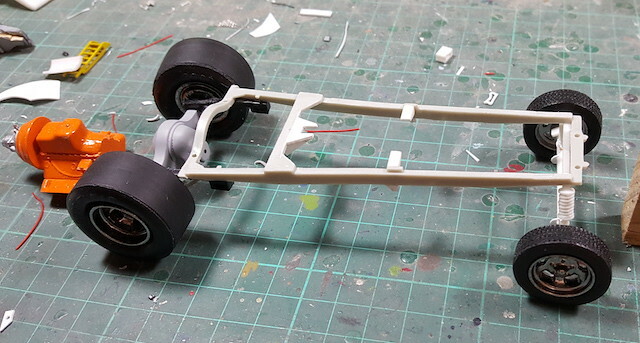 Began scratchbuilding wheelie bars today using some 1/72 aircraft nose wheels I pulled out of the parts box. No idea what they are off. 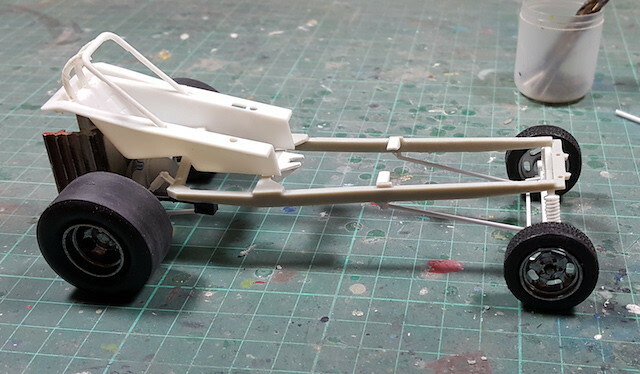 Also applied filler to the chassis rails and body. Chassis work is pretty much done. Cor, those sprung wheelie bars look the business. Did you scratch them or did they come from a kit somewhere? Thanks Kit. They are scratched. 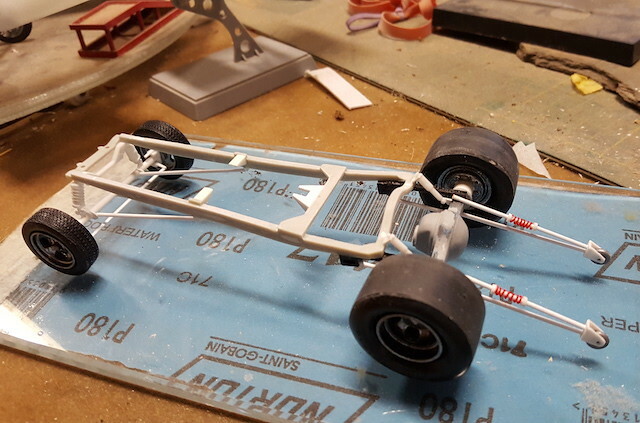 Wheels are 1/72 aircraft nose wheels and the springs are the wire I use for 1/25 plug wires wound round the rod. Body primed and undergoing PSR. Chassis likewise. Baby steps. 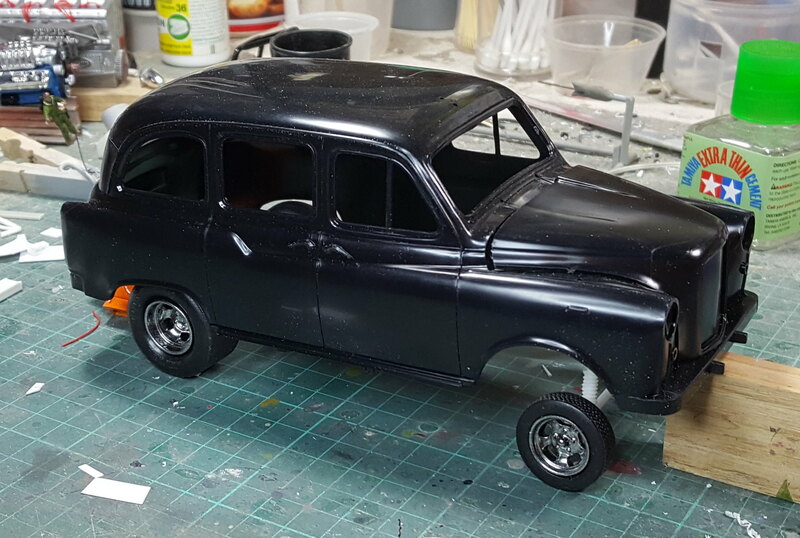 I have been building the interior panelling and have realised I need to have the engine fully built up to make sure it all fits. So i've been working on the double blower induction set-up.